Our debt to equity ratio calculator is a useful tool to help you calculate the ratio of a company's debt to equity more quickly, but it takes more than just the calculator to use this ratio effectively during your analysis of a company. In this article we’ll dive into the important details that will help you calculate and use the debt to equity ratio to enhance your financial analysis. Summarize a quick overview of our 5 step process for analyzing whether a company has a “good” debt to equity ratio. With the debt to equity ratio calculator and a good understanding of what the ratio is and how to measure it, you'll have everything you need to effectively and efficiently analyze how a company is financing its operations. The debt to equity ratio is calculated by taking a company’s total debt and dividing that by the company’s total equity. When calculating total debt, be sure that you are using the sum of both the company’s debt classified as long-term, as well as the company’s debt classified as short-term on their balance sheet. The amount that is included under the heading, Current Liabilities, is the sum of the loan payments the company will be required to make over the next 12 months, while the amount in the line-item, Long-Term Debt, is the sum of the payments required on outstanding debts from 13 months through the maturity date of the loan(s). The sum of those two numbers gives you the company’s total debt, which you’ll use to calculate the company’s ratio of debt to equity. This ratio is part of a larger family of financial ratios known as leverage ratios, which measure how much capital a company is utilizing comes in the form of debt (loans), as well as if a company has the ability to meet its required debt payments going forward (check out our deep dive into leverage ratios, which you can use to further understand how these ratios impact your financial analysis). The debt to equity ratio specifically focuses on providing insight into whether the company is financing its operations with equity or debt. Analyzing whether a company has a good debt to equity ratio depends on various factors, including the nature of the company’s operations, the trend of the company’s ratio over time, and how the company measures up to its peer group and industry competitors. If a company’s debt to equity ratio is high, this would be an indicator that they are utilizing more outside financing as capital to run the business. In this situation it will be important to analyze how the company is using the debt to improve the overall health of the company. When a company is using a lot of debt to finance its operations (high debt to equity), this could be an advantage to shareholders if the company is generating more earnings from the borrowed funds than it would have without the third-party financing. 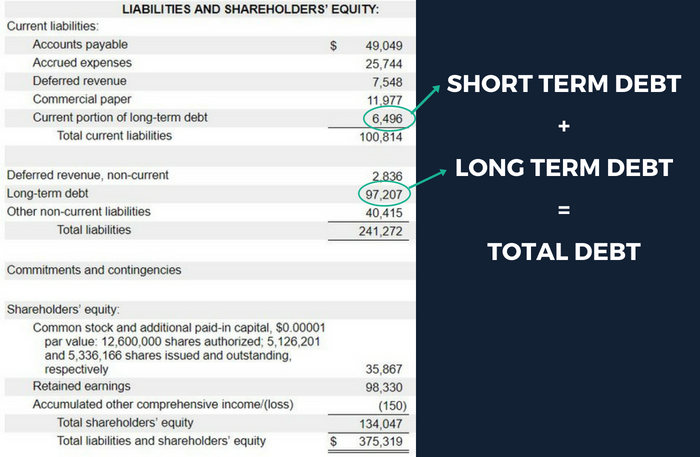 If the company is able to increase earnings at a higher percentage than the cost to borrow the money (i.e., interest paid on the outstanding balance, bank fees, etc…), then the shareholders would benefit from the increased earnings. However, as I’m sure you can guess, if the cost to borrow the money is outpacing the increased earnings generated from the borrowed funds, the shareholders value in the company would take a hit. Evaluating a company’s debt to equity ratio will give you a good idea of how a company is leveraged. As investors, we only want to see a higher debt to equity ratio if we are also reaping the benefits of increased earnings from the leveraged funds. Analyzing financial ratios can be difficult, and knowing where to start and how to complete your analysis prevents some people from ever getting started. We'll touch on five key steps to simplify your analysis of a company's debt to equity ratio below. If you're interested in learning more about financial ratio analysis, including examples of how to complete and interpret the results of your analysis, we've covered this framework and walked through the below steps in greater detail here. The first step in your analysis is to see what you can learn from the historical results of the Company. Once you know where a company currently stands, you can use this information to evaluate whether there are positive or negative trends that could impact the future results of the company. The second step in your analysis is to research the company and identify its industry and sector. A good place to start is a company’s Standard Industrial Classification (“SIC”) Code. You can find this information in a company’s SEC filings and check out a full list of reported sectors here. For broader industry categories, using an advanced stock screener or other research tools should give you what you need. Once a company’s industry and key operating characteristics are identified, the next step is building up a list of companies with similar operations to use as a peer group in your analysis. The goal of identifying and grouping companies with similar characteristics is to use this list to accurately compare and benchmark one company’s ratio, against another. If you don’t get this part of your analysis right, it can lead to misinterpretations down the road. There are several ways you can track down the information needed to form a peer group. Various tools and stock screeners on the web should have the information needed to analyze multiple companies. We covered this process in greater detail in our article that walks through how to use DiscoverCI’s value stock screener to quickly find and evaluate a company’s peer group. At this point we’ve calculated the company’s debt to equity, we know how the ratio is trending over time, and we also have a solid list of comparable companies. The next step is reviewing the financial statements and ratios of the company and its peer group to see where the company lands. Apple Inc. (AAPL) reported short term debt of $18,473,000 and long-term debt of $97,207,000 at September 30, 2017. They also showed a total equity balance of $134,047,000 on that same date. Evaluating a company’s debt to equity ratio will give you insight into how a company is leveraged and where they are getting the capital required to run the business. Strong companies utilize different sources of capital, but if capital comes at a cost, the best management teams are making sure that their benefit from the increased capital is outpacing the cost to borrow the funds. You are now set with the debt to equity ratio calculator, as well as the understanding and brainpower you need to calculate and analyze a company’s debt to equity ratio, but don’t stop there! Be sure to check out the best collection of financial ratio calculators on the web, as well as our blog, and subscribe to our email list today to become a member of the DiscoverCI Community. We've got you covered: Get Your Free Finacial Ratios Cheat Sheet! Subscribe to our email list today and receive our Financial Ratios Cheat Sheet, which you can use as a quick reference to the topics covered in this post! Subscribe to our email list and get investing tips, strategies, and news straight to your inbox. Access all member-only content and be the first to know about new posts and updates from the DiscoverCI Team. Get investing tips, strategies, and news straight to your inbox. Stay up-to-date on key factors impacting today's stock market. Be the first to know about new posts and updates from the DiscoverCI Team.